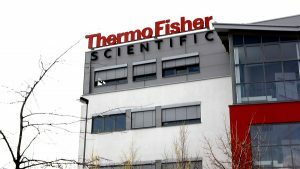 Biotech company Thermo Fisher Scientific Inc. (NYSE:TMO) has announced its intentions to buy Dutch drug-ingredients maker Patheon NV (NYSE:PTHN) for $7.2 billion. The deal’s value includes approximately $2 billion of net debt. A deal agreement could be reached as early as this week, according to people with knowledge of the matter. Under the terms of the proposed deal, Thermo Fisher would acquire all outstanding Patheon shares for $35 apiece in cash. The price represents a 35 percent premium over where Patheon’s stock closed Friday. Affiliates of JLL Partners and Royal DSM, whose holdings represent about 73 percent of Patheon shares, have agreed to tender their shares in the transaction. Thermo Fisher expects to finance the deal with debt of about $5.2 billion and the rest with equity. It has already obtained committed debt financing from Goldman Sachs Bank USA and Goldman Sachs Lending Partners LLC. The company expects the transaction to add to adjusted profit by 30 cents in the first full year after close. The deal is expected to close by the end of 2017. Thermo Fisher has announced $22 billion in acquisitions over the past five years, according to data compiled by Bloomberg. Last year, the company bought electron microscope maker FEI Co. for more than $4 billion. It also purchased Affymetrix Inc. last year. In 2014, it bought DNA sequencer Life Technologies Corp. for more than $15 billion. Patheon was formed in March 2014 through a merger of Canadian drugmaker Patheon Inc. and the pharmaceutical business of Dutch vitamin maker Royal DSM NV. The company is incorporated in the Netherlands, with its U.S. headquarters in Durham, North Carolina. According to its website, Patheon has a total of 26 office locations serving clients in about 70 countries. Patheon, which went public last July, generated about $1.9 billion in revenue last year. Patheon’s stock has risen 24 percent since its IPO and is currently worth about $3.8 billion. Shares of Patheon were up about 33 percent in premarket trading. Goldman Sachs & Co. is acting as financial adviser to Thermo Fisher, and Wachtell, Lipton, Rosen & Katz is serving as legal counsel. Morgan Stanley & Co. is Patheon’s financial adviser, and Skadden, Arps, Slate, Meagher & Flom LLP is its legal counsel. Accurate Investment Solutions Inc. Cuts Stake in Costco Wholesale Co.